All the necessary tools for QA testing process are in one system, from writing test plans and test cases to the test execution and spent time reports. 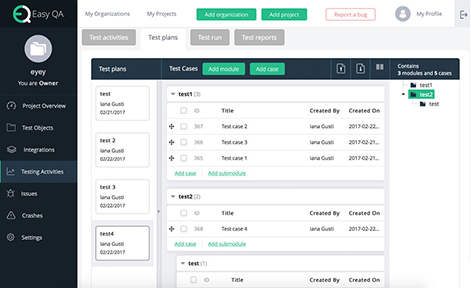 EasyQA allows you to execute test planning of all your processes: create test plans, split into modules, create test cases, and prepare checklists. 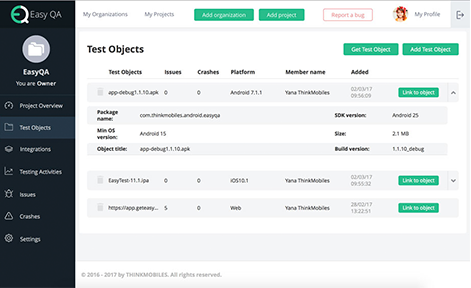 iOS or Android builds (.ipa or .apk file), a link to the website, which is a subject of testing, can be a test object of your project in EasyQA. 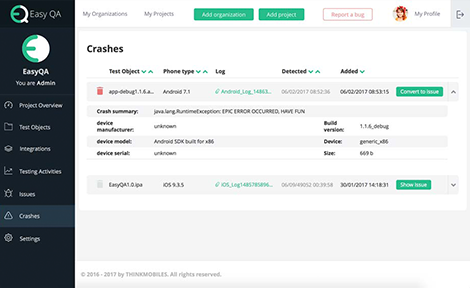 EasyQA Software Development Kit allows catching crashes, if they appear in Android or iOS mobile applications. Learn more about EasyQA Test Management Tool and try it for free.